Please read down this page and observe the many interesting events and stories involving our students, staff and community members. There are currently 9 stories. 1. Please see the Lets Go! 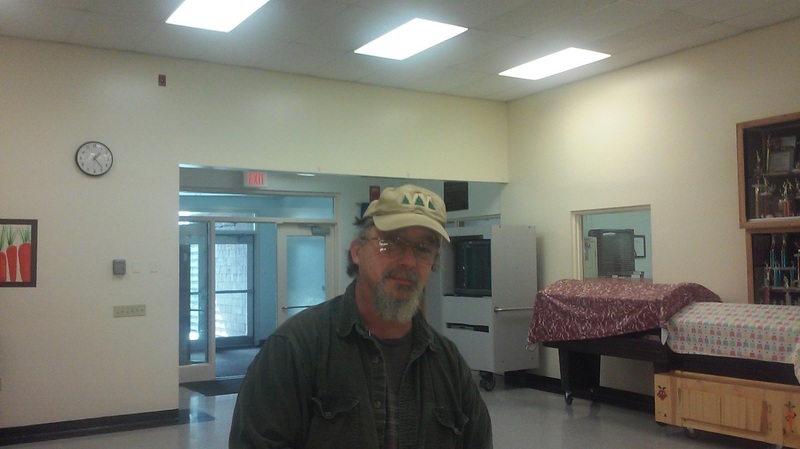 With Farmer Joe page embedded in the COMMUNITY/EVENTS tab. Just touch the menu item at the top of the page and you will see the Farmer Joe listed below. 2. The article below is about FHCS athletics. Please click on it and read the interesting article. Thank you. Forest Hills School is proud to announce that for the third year in a row the Forest Hills Varsity Golf Team, under the leadership of Coach Sean Danforth, has won the 2016 East-West Golf Championship. The event was held at Lakewood Golf Course on October 5th. Forest Hills completed the day with a score of 347. Second place went to Valley High School with a score of 413. Top individual scorers for the Tigers: Carson Veilleux 74, Javier Padilla 88 and Elise McKendry 91. Also competing for the Tigers were team members Quentin Rodriguez, Caleb Lacasse, Brandon Gilboe, Samuel Rodriguez and Jeremiah Hale. This victory has qualified the Forest Hills Golf Team to compete at The Maine Principals’ Association Class “C” State Championships on October 8th at Natanis Golf Course. In addition, Forest Hills has also qualified three golfers for The Maine Principals’ Association Individual Schoolboy/Schoolgirl Championships on October 15, 2016. Those qualifying are Carson Veilleux, Javier Padilla and Elise McKendry. Forest Hills is proud to announce that Elise McKendry, a junior at Forest Hills School, has won the East-West Golf Schoolgirl Individual Championship for the third year in a row. She finished the day with a score of 91 after playing 18 holes at Lakewood Golf Course on October 5th. Elise will golf next at the Maine Principals’ Association Team Championships as a Forest Hills Golf team member on October 8th and as an individual at the Maine Principals’ Class “C” Schoolgirl State Championships on October 15th at Natanis Golf Course. 5. October 5, 2016 Press ReleaseForest Hills is proud to announce that Carson Veilleux, a junior at Forest Hills School, has won the East-West Golf Schoolboy Individual Championship for the third year in a row. He finished the day with a score of 74 after playing 18 holes at Lakewood Golf Course on October 5th. Carson will golf next at the Maine Principals’ Association Team Championships as a Forest Hills Golf team member on October 8th and as an individual in the Class “C” Schoolboy State Championships on October 15th at Natanis Golf Course. 7. Senator King Visits Forest Hills High School From Washington, D.C.
On Wednesday, March 9, Senator Angus King visited the students and staff of Forest Hills High School from the Capital building in Washington, D.C. via a Skype session. 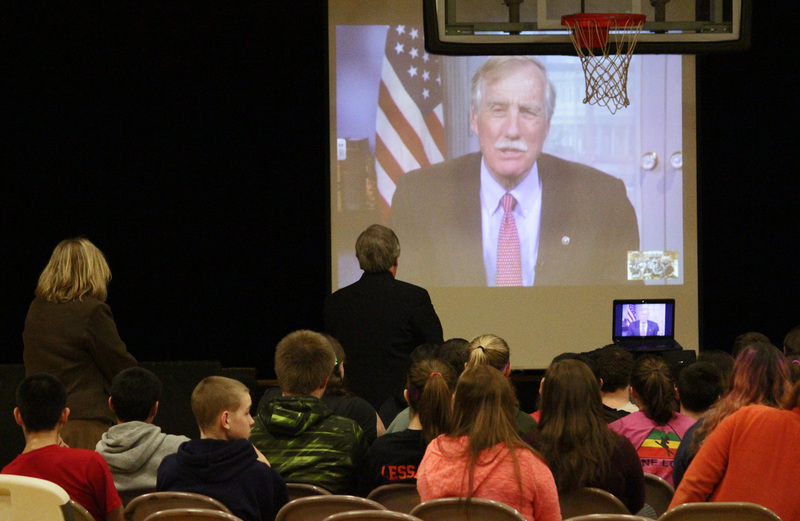 Senator King shared with the students what a typical week is like in Washington and back in Maine. Students were surprised to learn that he has very little personal time in his week. Students asked lots of questions regarding his opinion on such topics as minimum wage, gun control, supreme court nominations as well as topics such as his favorite books and music, to name a few. This visit was organized by Senator King’s Regional Representative Ben Tucker III through the Capital Classroom program. 8. Forest Hills Debate Team Ties for First Place!! JACKMAN – The Forest Hills High School Debate Team completed their most recent meet in the Western Class D debate team competition hosted by Valley on March 9th. Top Debater for the Tigers, Patricia Lessard (Junior), tied with Greenville’s Keegan Cannell for 1st Place with 43 points. Newcomers Caitlin Logston (Junior) and Madisen Logston (Freshman) also participated for Forest Hills (earning 39 and 37 points, respectively). The resolution: In The United States, private ownership of handguns ought to be banned. JACKMAN – Forest Hills recently announced the High School Debate Team completed their final meet for the 2015-2016 school year in the Western Class D debate team competition hosted in Jackman on April 11th. Patricia Lessard (Junior), Caitlin Logston (Junior) and Sebastian Paradise (Freshman) participated for Forest Hills (earning 3rd Place with a score of 129 points). The resolution: In The United States, private ownership of handguns ought to be banned. 9. Please see the document listed below as to how the votes for the school budget have gone over recent years. The totals include both Jackman and Moose River.